Over the decades Hollywood studios have made so many cute animal films. Disney and others target them for kids and pet owners that want to go “awwww” at the sweetness on the screen. Sometimes films feature famous actors as voice the pretty animals. Most of the times they put the cute animals on an incredible journey. Even when they do a documentary, they do their best to make the animals appear to be people in fur with a narrator to anthropomorphism the critters. Los Reyes is a documentary about two dogs that shows them in their natural state in a Latin American country. Football and Chola are two dogs that have taken up residence at a park in Santiago, Chile. There favorite place to hang out is on the lip of a skateboarding bowl. Right of the bat you can tell that these are not acting dogs. They are unkempt with bad teeth. They’re not going to be selling Gravy Train anytime soon. We don’t get any of their backstory. Directors Bettina Perut & Iván Osnovikoff don’t explain if they were always wild dogs, ran away from home or were abandoned by their owners. We don’t know if they are lifelong friends or just became survival pals on the playground. The main thing we can deduce is that the dogs must have been raised by people since they’re pretty docile around the skateboard kids. They bark at various things, but they are never truly vicious. Their kind nature keeps them from being chased out of the park. We see how the duo survive and small adventures during their regular day. They’re street hustlers as they search for food and tennis balls. Los Reyes does have a bit of humans talking although it doesn’t deal with the dogs. The voices belong to the kids that frequent the park. We don’t see their faces so they don’t distract from the dogs. But they have their stories. One kid has the dream of quitting school, running away from home and make a fortune selling pot laced edibles. But he learns that this isn’t really a great dream. If anything Football and Chola show how living in the park isn’t a great career choice. There’s no one looking after them. Things are rough for the duo since and looking bleak as health issues crop up. This is not a cute Disney nature movie since there’s scene where one of the dogs gets frisky with a visiting pup as the other watches. This would the kind of nature special I’d expect from Abel Ferrara. Cinematographer Pablo Valdés frames the world from the dog’s perspectives. He breaks out the macro lens to get deep into the dog’s life. Bettina Perut & Iván Osnovikoff edit a narrative to the film without betraying the plight of the Football and Chola. 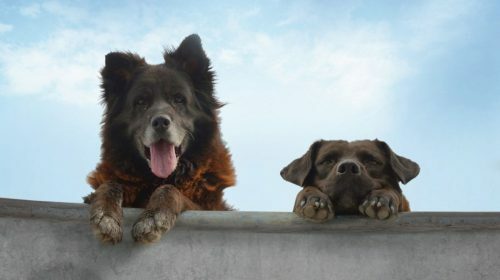 Los Reyes is a perfect portrait of those stray dogs you see roaming around the park. Los Reyes was reviewed at the Full Frame Documentary Film Festival in Durham, North Carolina.